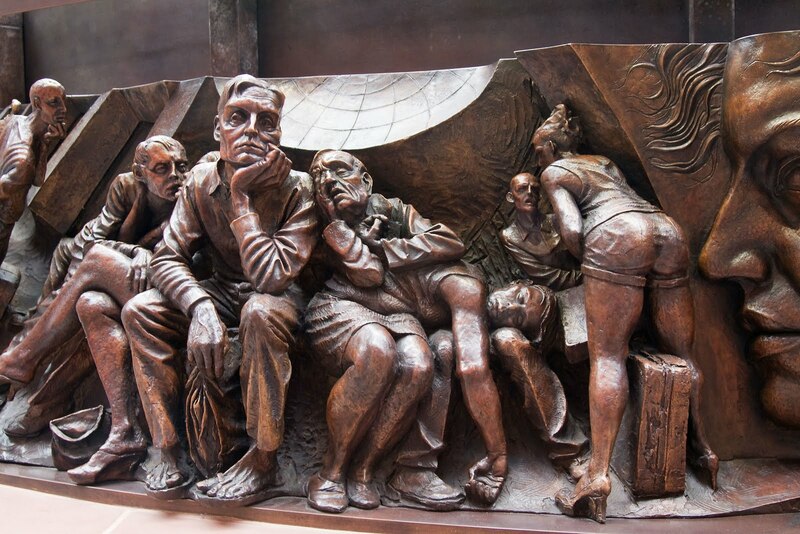 It's impossible to miss the 9 metre high statue, by Paul Day, of the kissing couple at St Pancras Station. However there is more to see if you get up close. A couple of years after its installation a frieze was added around the bottom. This is part of that frieze. Meet there next time and take a good look at it. Oh beautiful! I am catching a train from there in three weeks - must make time to take a look! I took some photos of the 'big stiletto' just after they first unveiled it, but I've never seen the frieze. It's not exactly positive advertising for their train services is it! "... and they waited happily ever after". What a great and expressive sculpture. They are not trainspotters, just sitting and waiting for a train. LOL here in Montreal that would be 'waiting for a city bus'! They're doing better now, but a few years ago, their punctuality, or lack thereof, was notorious! They look like they've been waiting for a long time. The detailing and playing with perspective is very good throughout this circular frieze and impresses me in a way that the oversized statue which it adorns does not. More to my quiet tastes is the larger-than-life-size but understated statue by Martin Jennings located not too far away of Sir John Betjeman, looking up at the roof that he helped to save. The waiting room must be a nightmare. Their expressions and stance are fantastic. But it doesn't say much for the train service, I think. I'm going to have to go back and find it! OOOOOOOOH!!! I never saw it!!! How come!!! Oh, cool! I wasn't aware of this statue. Can't imagine how I've missed it! Hmmm. That's not the kind of image I'd want to see at a highspeed station. It might give the rail bosses ideas!! !